Most golf courses are designed for experienced golfers. These golfers like the challenge of long enough holes, approach shots requiring careful execution, fast contoured greens and the rest. Such layouts are great at keeping these golfers coming back and in that way benefiting golf in general. However, the demands of full-sized course can discourage some people interested in becoming golfers. In recent years in the U.S. the total number of participants has plateaued. Beginners, golfers of any age in formative stages and those of limited playing skill can find most holes impossible for them to reach in regulation, their approach shots must carry hazards and greens often cause them to three-putt or worse. A reason why far too many people might quit is because at first they feel overwhelmed by regular courses. Somewhat kinder playing requirements would not seem so hostile, maybe meaning more beginners remaining with the game long enough to get hooked. Beginning downhill skiers almost always start on slopes appropriately labeled as “Very Easy” and “Easy”, before eventually moving onto those designated “More Difficult”. If they become good enough skiers, some might one day go on to the “Most Difficult” rated slopes. These latter slopes could be compared to “championship” golf courses. We typically all learn things more effectively at simpler levels before advancing to the complex. This way we are more likely to stay with the learning process until we gain competence and more confidence. The golf holes most starting golfers play should be the same way. With alternative greens in addition to their regular greens, any golf course can provide more suitable conditions for learning golfers. Let me explain further. Temporary greens have been used at most courses during times when regular greens are not ideal for play, need to be repaired or should be protected. In the Sun Belt this can be related to overseeding and in the North due to winter weather. Temporary greens usually are mowed-down, small, round areas short of regular greens. An interim rule of a maximum of two putts can be in effect because of the bumpiness, abundance of weeds and inconsistency for putting on these temporaries. An alternative green of better quality than typical for temporary greens could be established on each hole of golf courses. These like temporary greens would also be short of the regular greens in suitable places in the fairway, at the edge of the fairway or to the side just into the rough. A free drop off these greens would be given for play to the regular greens. These areas could be improved through long-term maintenance practices or built with accepted green construction methods. They would not have severe slopes, not be as fast as the regular greens, nor require particularly demanding approach shots. In large measure these greens would be designed and maintained to be easier than the regular greens. They could even have an accompanying sand bunker or two, but nothing in number or difficulty as around regular greens. These would be alternative greens that are permanent, serving in a superior way the same functions and a lot more than temporary greens. These could be called Amicable Greens since they would be friendly in nature to golfers just learning the game and to experienced golfers occasionally playing them when regular greens should be closed. Being short of the regular greens would of course shorten holes. From the forward tees this is even better for beginners, learning golfers and very short hitters. Scoring is almost directly proportional to the length of golf holes, which is why all handicap systems are based on this element. People of lesser golfing skill could complete these holes more quickly due to them being shorter and easier. By playing alternative greens, anyone lacking knowledge of proper course care could never scuff up the regular greens by dragging their feet or through other carelessness. When a regular green is damaged, being worked on or should be closed for any reason for a time, these greens would be used by all golfers. If decided, this could also be during and for a while after aerification, verticutting, topdressing, even spraying and other major maintenance operations on greens. These alternate greens could be valuable at overseeding time in the fall in the South and then during the transition period in the spring. In the North for some winter months they could keep golfers off regular greens altogether while permitting the continuation of play. During those times, for experienced golfers each set of their tee markers could be moved back equal to the shortened distance to regular greens. That is except for those men who normally play from the tips and, fortunately, there aren’t a large number of those golfers anyway. 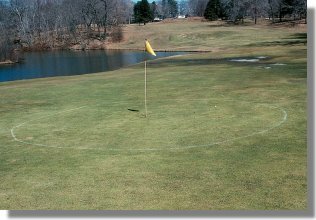 There are several important questions when a course is considering or has decided to install alternative Amicable Greens. Where is the ideal location for each? The type of hole and contours short of each regular green are key to their best location. Then, as with regular greens, what individual size and shape is most fitting for each? There is how to prepare them and estimating how much the different options would cost? Costs can vary widely according to how basic or elaborate would be their preparation. They could be done a few at a time to spread out their cost into several years and allow a course’s maintenance crew to do as much of their installation as possible in the off-season. There should not only be a program spelled out for such a project, but a budget to anticipate its cost. A golf course architect who believes in the advantages of Amicable Greens to a course and for its golfers can provide valuable assistance in accomplishing this project correctly. An Amicable Course could easily be included while designing a new traditional-type golf course. More often it would be done at existing courses which want to make conditions more inviting to starting golfers and provide acceptable greens anytime the course’s regular greens should not be used. Amicable Greens will be appreciated by avid golfers during those times, give a favorable friendly welcome to beginning golfers all of the time and allow the maintenance crew to do certain essential operations to regular greens without significantly interfering with anyone’s play, so benefiting everyone at a golf course and golf in general.